Serving medical and economic development in the Democratic Republic of Congo. The latest PCP Medical Ambassadors training team has returned from Congo! The stories of their experiences are overwhelming. Dr. Bob DeMaster, RN Ann Hagensen, Dr. Eric Gunnoe, Dr. Linda Lindquist, Dr. Kurt Lindquist, and Dr. Jerry Oliaro worked together to conduct surgical training, to present a 15 hour course for 25 doctors and nurses on emergency care of trauma patients which included learning station practicums, to meet with two nursing schools’ faculty and students, and to visit clinics to discuss emergency trauma care and transport systems. Dr. Linda Lindquist wrote about one of their patients, pictured here after surgery. Lidia was a 7½ year old who came in with her grandmother. The two escaped fighting and gunfire from the neighboring country of Central African Republic, walking 155 miles to Gemena, DRC. There they learned that a surgery team was coming and walked the rest of the way to Karawa. We were able to repair her cleft deformity. The grandmother believed that a lizard had bitten a piece of the child’s lip in utero and that was why she was born that way. They had no money and no hope for change. The grandmother’s name was Nzapa Kimbi, meaning, “God doesn’t like me”. Now, she can rejoice that something good has come into their lives. God’s timing was perfect for her! At Karawa, the team performed 12 cleft lip surgeries and 2 prostate surgeries, all with the purpose of teaching Congolese doctors and nurses. 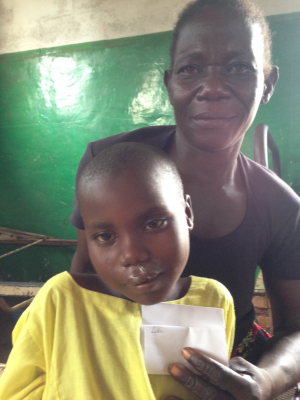 Many other families came to Karawa in hope of being seen by the team for cleft lip treatment, and there are countless numbers of other children needing the operation. Posted in Medical Ambassadors, PCP Update. Time for a Coffee Break! I am a coffee roaster and/or retailer. The Paul Carlson Medical Program, Inc. is a 501(c)(3) not-for-profit organization of the Evangelical Covenant Church..